Probably the most important innovation of Craig's telescope was its lens. It had a diameter far greater than any that had been attempted up this time. The "telescope" as a technology was invented in Holland, although some controversy exists over the actual inventor. The invention is usually ascribed to Hans Lippershey (1587–1619), a Dutch spectacles maker, in about 1608. Galileo exhibited, in 1609, the first telescope on record. The German astronomer Johannes Kepler discovered the principle of the astronomical telescope with two convex lenses. This idea was actually employed in a telescope constructed by the German Jesuit astronomer Christoph Scheiner (1579?–1650) in about 1630. Because of the difficulties caused by spherical aberration, astronomical telescopes had to be of considerable focal length - some of them up to 200-ft (up to 61m). The invention of the achromatic object glass in 1757 by the British optician John Dollond (1706–61), and the improvement of optical flint glass, which began in 1754, soon permitted the construction of improved refracting telescopes. 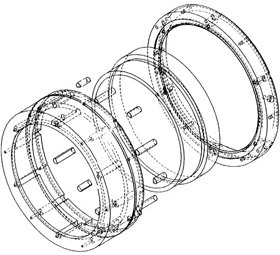 Dollond's lenses were only 3–4 in. (7.5–10 cm), however, so these telescopes all had modest dimensions. Methods of making large disks of flint glass were discovered in the late 18th century by Pierre Louis Guinand (1748–1824), a Swiss optician, who became associated with the German optician and physicist Joseph von Fraunhofer. Guinand's discovery permitted the manufacture of telescopes as large as 10 in. (25 cm) in diameter. It consisted of two pieces of glass of different refractive indexes, usually crown and flint glass, held in close proximity in a metal cell forming a single object-glass or achromat lens. Achromats had been invented in 1733 by Chester Moor Hall in a successful attempt to combat the unwanted effects of color "fringing". Chromatic aberration as it is known, is the inability of a single glass lens to focus all colours to the same point - red light is bent less by it's passage through glass than blue light (the same effect causes a prism to separate white light into its component colours). The effect is always worse the more curved the surfaces. This it true for refractors of short focal length - being at its most pronounced towards the edge of the field. The Clark brothers and the 40-inch lens of the Yerkes Telescope. Up till this time no lens larger than 15-inches existed. The accepted sequence for the change of hands of the title of "world's largest refractor" after 1847 runs something like this: In 1862 Alvan Clark of Massachusetts built an 181⁄2- inch instrument that brought the record across the Atlantic for first time . (This lens was made for the University of Mississippi, but actually went to the original University in Evamston, Illinois. While testing this lens, Alvan Graham Clark, the son of the firm's founder, had first spotted the companion of Sirius). 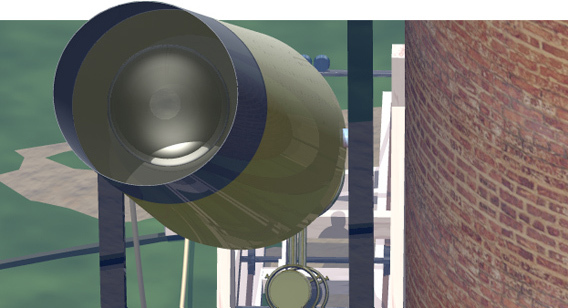 How the Craig Telescope lens may have looked. 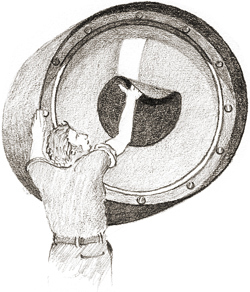 The two disks, which together weighed 146 pounds, took seven years to grind, polish, and then mount in an equatorial support of Cooke's own design. Indeed, so difficult was the task, so great the responsibility that Cooke's death in 1868 ( a year before the completion of the telescope) was undoubtedly hastened by the pressures of the project. The "Newall Telescope" was installed on the owner's private estate at Gateshead in the northeast of England, where unfortunately the weather be put to little good use. In 1891 it was presented to the Solar Physics Observatory, University of Cambridge. After a few slight increases in the size of the largest refractors on both sides of the Atlantic, the laurel returned to the United States in the 1880s when the Clarks made the 36-inch lens for Lick Observatory in Wisconsin. (For the record, this is not the largest refractor ever built. 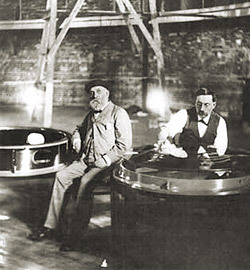 At the great Paris exposition of 1900, a horizontal 49-inch instrument was installed and then dismantled after the fair. We know little of the Craig Telescope lens except for a few facts gleaned from press cuttings of the time. The figuring of the huge doublet was the work of Thomas Slater of Euston. Since the project was suggested to him no earlier than about 1849/50, he must have laboured almost continuously to complete the two component lenses on time in early 1852. In a reference from the Annals of Science of the time it sugests that the machinery used by Slater was "simple". There were two components making up the achromat lens of the telescope - one of flint glass supplied by the Chance Company and the other of plate glass undertaken by the Thames Plate Galss Manufactory. There are no records of the task given him, but certainly it would have tested the patience of Job. Just handling the enormous pieces of glass would have taken quite an effort. We do know that he figured all four surfaces by hand without the help of any grinding, figuring or polishing equipment. A stupendous task. 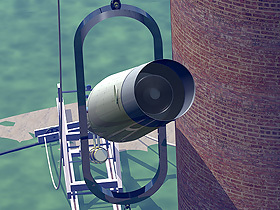 Even though we know today that Craig's telescope was not a success, Slater's part in the project cannot be criticised too hashly, even though one of his lenses was slightly under-corrected. He had offered to refigure the culprit component lens, but Craig was adamant that any correction might simply make matters worse. There is mention in The Machanics Magazine of 1852 vol LVII of a possible reparation, suggesting, "Mr Gravatt has devised a plan by which the lens, which was polished in the first instance by four workmen, may now be re-polished, by machinery, upon such accurate mathematical principles as will prevent the possibility of error. The machinery is somewhat similar to that by which the reflector of Lord Rosse's gigantic telescope was polished, with the difference that the reflector being concave and the Craig lenses convex, the machinery will act reversely". Perhaps the truth of Craig's intervention had more to do with either money worries or other failings of the telescope's design. Looking down the tube of the telescope, we can see the 24-inch lens held in its cell. Also notice the small access hole to the left just below the lens hood. 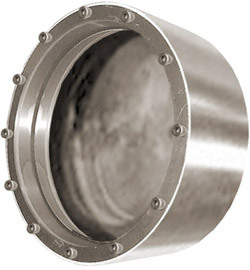 This may have allowed heat inside the tube assembly to escape, cooling the optics more quickly. 1826 ADD Science 88 p 105 "The manner in which these object-glasses are fitted into the tube is a marvel of artistic invention. By means of 12 screws, numbered according to the hours of the day, they can be set in an instant to any angle the observer may require, by his merely calling out the number of the screw to be touched. The object-glasses also move round in grooves to wherever it may be considered that a more distinct view can be gained. Bearing in mind the undercorrected optics it may be that the astronomers were for ever trying the obtain the optimum performance by adjusting the lens within the cell. The lens was made by Mr. Thomas Slater of Somers Place in Euston Square. It was a composite of two pieces of glass, one of flint and the other of plate. The plate glass lens had a positive focal length of 9,182mm, the refractive index being 15103. The flint glass component had a negative focal length of 15,201.9mm with a refractive index of 16308. Combined, they formed an achromatic lens (reduced colour fringing especially at the edge of the field) with a focal length of 23,164.8mm. Craig's telescope had a lens of 24-inches allowing the observer to see faint objects, perhaps as faint as magnitude 17. The limiting magnitude of such a huge lens would have been 17th. Trying to trace the whereabouts of the lens today has proved impossible. The huge lens still had to be stopped out to try and make it work a little better. In an article in the Illustrated London News, 16th October 1852, it suggests that it was Craig that intervened in preventing the lens being corrected by Slater, stating, "Mr Craig seems to think, were he to attempt to have this five thousandth part of a inch corrected, it might be over-corrected the other way, and thus more harm than good be the consequence". Slater was never a man to be left out of the public eye, taking every opportunity to get his name recognised. An article in The Times, shortly after the telescope was announced to the public, failed to mention the part Slater had played in the project. Slater wasted no time in berating the the editor in a letter that he would later regret having written, "Your correspondent has given a fair statement about all concerned in this instrument, with but one exception - namely, your humble servant, who was the first to undertake to make this telescope, and the object-glass and all the optical work were contracted for and worked by me. If there is any merit in this great undertaking, let me have my share of publicity." 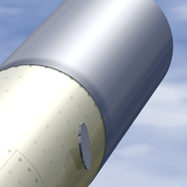 At the top end of the tube of the telescope was a small hole. This was either for easy access to the back of the lens or it was a simple way of removing heat build-up within the tube during the day.